BRUSSELS, Belgium -- The European Union has not offered Ukraine the prospect of full membership of the Western bloc so a fully-fledged membership of the Russian Customs and Eurasian Union is a better deal, the Russian ambassador to the EU told EurActiv in an interview. 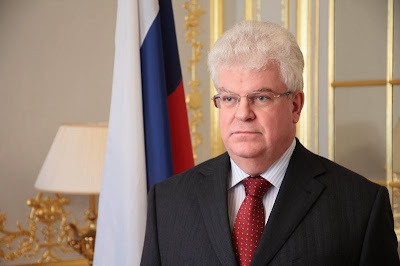 In a wide ranging interview with EurActiv, the Russian ambassador to the European Union, Vladimir Chizhov said it was in Ukraine’s interest to join the Customs Union with Russia, Belarus and Kazakhstan, which would develop into a Eurasian economic union by the end of next year. Chizhov said that Russia was offering Ukraine, Moldova and Georgia full membership of its Customs Union and the Eurasian Union. However, “The EU has never offered Ukraine or any other focus country of the eastern partnership, full membership or even a perspective of membership,” he said. Ukraine’s economy would struggle in a free trade agreement with the EU because its products were not up to European standards, he said. Chizhov added that Russia would also need to step up border controls with its southern neighbour to protect itself from the flow of huge amounts of customs-free EU goods, which he said would be “detrimental” to Moscow’s interests. “We are trying to open everybody’s eyes to the opportunities of joining the Customs Union. And the risks that taking certain obligations as associate members of the EU might entail,” Chizhov said. Russia’s top EU envoy added that even if Kiev signed an association agreement with the European Union during an Eastern Partnership (EaP) summit in Vilnius in November, the next Ukrainian parliament may not ratify it. “We believe that the unanimous decision of the Ukrainian government to proceed with the signing [of AA] may not fully reflect the range of opinions that exist among the population of Ukraine,” the Russian diplomat said. Chizhov condemned the Western bloc's policies towards Ukraine and the other countries covered by the EaP iniative: Moldova, Belarus, Georgia, Armenia and Azerbaijan. He added said that it was the third EaP summit and that the other two had been “barely noticed by the wide circles of public opinion, except perhaps in the individual countries – and they didn’t produce much”. The six EaP countries were now down to three, Chizhov said. Ukraine, Moldova and Georgia are all pushing for deeper ties with the European Union. But Armenia had already “made a different choice”, while Azerbaijan was not interested from the outset and Belarus was never offered the perspective of an EU association agreement, he said. President Serzh Sargsyan announced last month that Armenia would join the Customs Union. EU politicians said this marked the end of the country’s path towards greater integration with the Western block. Chizov also stressed that Kyrgyzstan and Tajikistan had applied to join the Customs Union, while Georgia’s recently elected prime minister, Bidzina Ivanishvili, had expressed a will to join the Russia-backed project “not today, but perhaps”. In an interview with Radio Free Europe last month, Ivanishvili said that his country was aiming for the EU but did not rule out joining the Eurasian Union. The Russian diplomat said that the Vilnius EaP summit on 28-29 November was attracting a lot of attention but for the wrong reasons. But the interest was not because the EaP had become successful or that it had “required a separate line in the EU budget”, a promise of EU aid, he said. The reason for the interest, he said, was that Ukraine was expected to sign an association agreement with the EU, and was set to open its borders to EU trade with a Deep and Comprehensive Free Trade Agreement (DCFTA), and that Moldova and Georgia were expected to initial similar documents. The diplomat added that he had read the draft of the Ukrainian association agreement, which has been published, but that he could not judge the deals with Moldova and Georgia, which had not been made public. The EU-Ukraine association agreement was recently leaked in a blog. But the Commission confirmed it had not yet been published officially so it may not be finished. Chizhov rejected the view that his country was placing politically-motivated barriers on the imports from those countries as a punishment for their moves towards deeper ties with the EU.